Changing the seat covers is an easy way to revamp dining chairs. A coat of paint sometimes helps, too. 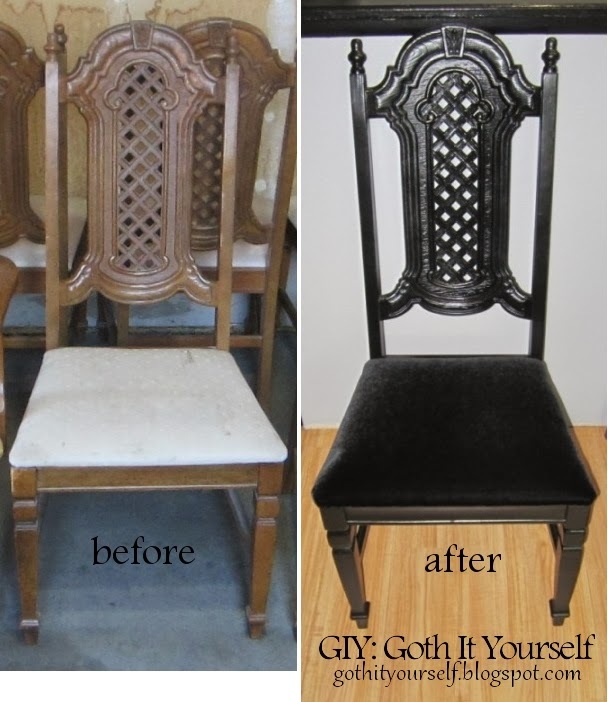 :) For my new (old) dining chairs, I kept the look simple with basic black-on-black. I found the chairs (and matching dining table) on craigslist. The chairs were sturdy, but the seat covers were in horrible shape. The original covers had been gold, like the chair on the left above. The seats were later covered with a beige fabric (by someone who should never be allowed near a stapler again). After pulling out what felt like 10,000 staples, I removed the beige fabric to reveal... more staples! When I tried to remove the ancient gold fabric, it practically disintegrated. After pulling it off the first seat in strips and strings, I decided to leave it on the other seats. To help smooth out the worn corners and provide a bit of padding, I added a layer of white fleece. For the main cover fabric, I used some black velvet that I had on hand. I laid it out, placed the seat on top, and cut the fabric about 2-3 inches larger than the seat. Keeping the fabric taut, I stapled it in place, paying special attention to folding the corners. I spray painted the chairs black and put the seats in place. Done! Yes, I spent quite a bit of time attacking staples with the flat screwdriver and the pliers. It was not one of my more enjoyable experiences, to say the least. I love these! Amazing transformation! The black on black is very elegant! I'm not very good with spray paint - too many missed spots and/or drips. The trick with spray paint is to have proper lighting, and then to look at the object from every possible angle to catch the missed spots. I'm in a painting mood as well. :) But the cold, snowy weather precludes any more spray painting for a while. Oooh, I love it! I want my main room to have black and white Victorian style, but I think my living room will be more crimson! Great redo! oooh, these look like they'd be right at home in a dungeon. I approve. I am intrigued by your ideas. Take lots of pictures, or ask me to participate. I love what you did to these! Oh, my gosh, I'm beginning to think we're sharing a brain! I went on craigslist recently, and bought a 70s-tastic dining set that could be cousins to yours. I can't wait 'til the weather improves enough that I can paint it. If I get really ambitious, I may even try a faux zinc finish on the tabletop. Anyway, congratulations on your find! They look gorgeous now! My set came with a table as well. I already have a dining table, so I'm not sure what I'll end up doing with it. A faux zinc finish sounds really interesting! I was going to do the exact same with my own dining room set, but they're far too plain to put that much effort into them, so I just put it off, hahah; they're literally nothing special, as basic as basic can really be. Changing them color won't do anything lol. And you just made them stunning! I had a dining set that was completely plain, but I painted it anyway. And put bat fabric on the seats. :) Though it didn't add class or sophistication, it made the set a little more fun. Thank you very much! The set was a table and seven chairs... I need only four chairs at most, so I may end up reselling the table and some chairs. Nooo, there is no arguing with color black, getting the new tables and chairs is the problem.. xD Marriages..
now im going to be going to "how would this look painted black?" i now dub you a fallen angel for this!!!!!!!! Silver thumb tacks might make a good substitute for the nailhead trim often seen on upholstered chairs.